Quantifiable Edges: Do Reversal Bars Really Work? Do Reversal Bars Really Work? Over the first 1-7 days, it appears to be a toss-up, but as you look a little bit further out there appears to be a solid edge to the upside. One reason the edge appears to be lower in the first few days is that the market has just made a large move up. Frequently this initial thrust takes a few days to digest (more on that lower down). What I find especially compelling about this scenario are the size of the average winners - especially when compared to the average loser. If the reversal bar works, the expectation is for somewhere around a 4-5% follow through in the next 2-4 weeks based on these results. Note the win/loss ratios and profit factors once you get out more than 10 days. They're quite good. For a more detailed look I evaluated the results 14 days out. That would put us at the end of the month and the next Fed meeting. Obviously no one will be worried about this backtest when the Fed is about to announce. Fourteen days out 16 of 24 trades were winners. Of those sixteen winners, all of them pulled back at least 0.5% from the reversal day close at some point. The average drawdown among those 16 winners was 2.6%. The largest drawdown among winning trades was 6.6% which occurred after the reversal bar last August 6th. Five of the sixteen winners actually posted a lower low before turning higher again. In other words, it's probably not neccessary to chase this trade. There will most likely be some backing and filling which should allow for a better entry point or some scaling in. This one gets stamped "quantifiable edge". I really liked your blog and I have added it to my Rss feed. There is just one problem. I'm having a hard time to see the charts/tables because they do not zoom in and when I download them they loose much definition when zoomed in. I'm a new blogger too, I have a blog in technical analysis. Unfortunately it is writen in portuguese (I live in Brazil). You do not have to bother sending me the pictures I do not want to disturb you, but thanks anyway. Just found your blog and like what you have posted so far. I was wondering which sw are you using for your backtesting? Most of my testing is done in Tradestation. More complex things like the CBI require some additional steps and code. I'm uncertain what the exit criteria are for this trade. 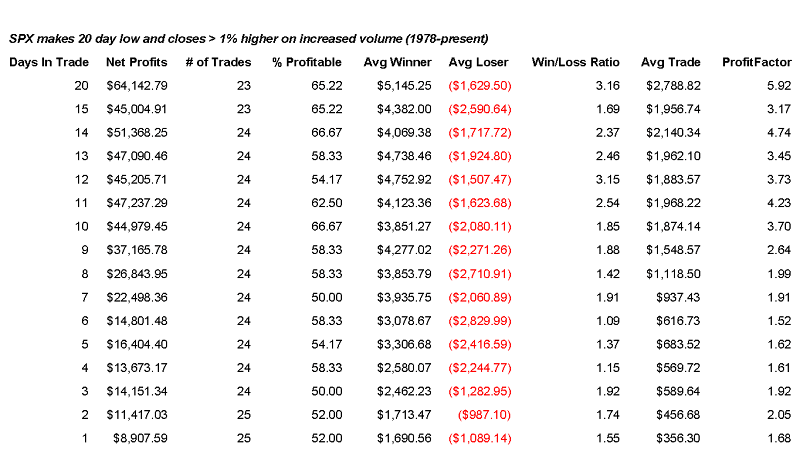 It appears the analysis is calculating the profitability by how long the trade is held (day in trade column); however, why don't we have the same number of trades (3rd column) across all holding times? There were a couple of instances where two large reversal bars occurred within a short time period. (See 10/8 and 10/10/02 on a chart.) In this case a 2-day exit would buy the 10/10 bar because it was another unique instance, but a 3+ day exit wouldn't because you would already be long and I didn't want to double count instances. Great work Rob. It would be interesing to see how the "20 day low breakout" stats measure within longer term bull and bear markets. I ran the reversal bar study again to see if there were significant differences when the market was trading above its 200MA vs. below it. I found no substantial differences among the sample sets. Hi Rob--this all looks extremely interesting and I'm looking forward to your future posts. It's tracking the S&P 500 cash index. I don't know if I have the wrong quotes, but it seems that the SPY didn't make a new low compared to Tuesday. And the SPY should be a better measure of how the market participants really acted. Don't you all agree? So I think these studies should be done on the SPY alone. Please see my Jan 24th post "CBI, Reversals..." for a response in the comment section. Sentimentrader.com made a study coming up with an another conclusion. SP is down -1% and hit 1M low, but closes up when 200MA is sloping down. First 3 days looks pretty positive, but in 10 days it is negative values. I think it is very important to use the 200 MA filter. Obviously in a bull market the market is most usually higher the more days in the future you look. CBI Spiking - How Bad Can It Get? Gap Lower Ahead - Bounce Still Likely?